In recent times, there has been an increase in the popularity of Spanish cuisine. Nation chain La Tasca have been serving up tapas for many years whilst bars and restaurants have been adapting menus to accommodate the tastes of Spain. 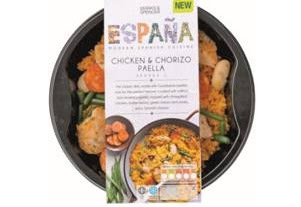 In the coming weeks M&S will be launching "Espańa", the first range of Spanish main courses on the high street. They have raided the Spanish larder to create a range of meals packed full of the flavours of Spain. From olives and hams, to vinegars and sherries, all the ingredients used are authentic. Try one of their classic Paellas or go for the Chicken with Patatas Bravas & Garlic Aioli. The Piquillo Pepper & Tomato Bread is the ideal accompaniment to olives, slice chorizo and roasted peppers for a speedy Spanish starter. The meals will be available in the larger store M&S stores nationwide with prices starting from £1.99 per dish. I normally find Spanish inspired ready meals to taste of too much tomato and far too much poor quality paprika. I'll be interested to see if M&S can apply the same high quality to this new range that they do to their existing ready meals, if so they might be onto a winner.